A TermQuery is usually much faster than a PrefixQuery, since it decodes a single docID list vs PrefixQuery which must decode N and do a "union" often with the same doc appearing in many lists. in according to our measurements this hit gives about 20% performance gain. Sorry, what's 20% faster? TermQuery vs PrefixQuery? flipping to TermQuery on EdgeNGrams in case of short string for suggestiing gives 20% performance gain in comparison to using PrefixQuery always. I'm surprised it's only 20% gain! I'm surprised that it's so much! I see that it can win if the same prefix occurs more than once in the same string e.g. WOmbat WOmen bag. I've thought that we don't have many such cases. Hi, I need a small demo source code implementation Lucene Infix match suggestion where input query and hits will load from a text file. Or I need a help to implement that in step by step process. What should I do. import org.apache.lucene.search.spell.TermFreqPayloadIterator was not recognized; what maven dependency should I include? I have included a dependency for Spell Checker. I am confused about how I build an index that AnalyzingInfixSuggester can use. I've tried using an existing index that I have but lookup() returns no hits. The line "It also uses the new index sorter APIs to pre-sort all postings by suggested weight at index time" implies that I have to build a custom index that the suggester can understand but I can't figure out how this is done. Is there an example of basic usage for AnalyzingInfixSuggestr? Thanks! See the unit test in my comment above as an example. Oops, that's what I get for not refreshing the page before commenting. I assume you meant to post this link: https://svn.apache.org/repos/asf/lucene/dev/branches/lucene_solr_4_4/lucene/suggest/src/test/org/apache/lucene/search/suggest/analyzing/AnalyzingInfixSuggesterTest.java ? The other one goes to the source. Thanks, it looks like a good starting point. Woops, indeed I did! Thanks for posting the correct link! I am having trouble translating this to lucene 4.4 some classes are missing some are renamed and the test did not show how to point real index that AnalyzingInfixSuggester to rebuild with "payloads" and "weight". Can somebody help? The above link is to the 4.4 unit test, so it should compile fine against 4.4. Could you send your question to the java-user@lucene.apache.org lists, and include specifics about what you tried to do / what failed / etc? Thanks. I have build the tests but when point analyzer to my index it rewrites all data except the "text" "textgrams" "payloads" and "weight" and acquire lock on the current file. You should not build your own index. AnalyzingInfixSuggester builds its own index, under the hood when you call the build method. Yes saw it trough source. One last stupid question, how to tell the suggester to treat new readed document(since i am iterating over my original index with doc.get"content" and doc.get"id" and next id) as separate document since every read its starts from clean index(dont add terms from the last document). Unfortunately the suggesters don't support "incremental building": you have to fully rebuild the suggest index every time. That said, since AnalyzingInfixSuggester is just an index under-the-hood, it could in theory easily support adding to an existing suggest index ... it's just that nobody has implemented it yet (patches welcome!). So, if understand right for every query it has to build the index again? how will find matching documents if it can read only one document at a time. No, it doesn't rebuild the index for every query. It rebuilds the index whenever you want to change the suggestions (ie, whenever you call the .build method). The lookup method find the best suggestions of all the ones you indexed with the build method. Posted reply with source if this can help. This looks like it is exactly the functionality I have been wanting to implement. I just downloaded and installed solr 4.4 and tried to set this up, however I'm not sure how to reference this in the Suggester setup since I don't see an AnalyzingInfixLookupFactory or something similar. Can you point me in the direction I would need to go to reference this in the solrconfig? Alas, there is no factory for Solr yet, so at the current time you can't use this suggester from Solr (patches welcome!). My long outstanding question and doubt, using lucene how can i index date and numbers,, say credit card numbers,,, finance transaction journals... these journals have lot of numbers,, and date.Am still to crack, apprecaite your help / suggestion. Searching on dates and numbers is not a problem; you can use NumericField for a numeric or date field if you want to do range filtering, or just index numbers as individual tokens as part of the text (make sure you use an analyzer that preserves numbers). Thanks a ton Mike, i ll write an email. Hello. In order to use AnalyzingInfixSuggester do I need to invoke build() method also. I created index with normal code. Passed the location of this index to AnalyzingInfixSuggester. The lookup list is always 0. The analyzer used is StandardAnalyzer. Where I might be going wrong. You should not build your own index ahead of time. Instead, you call the build() method, which under the hood builds its own index. You feed it a TermFreqIterator (or TermFreqPayloadIterator) that enumerates all of your suggestions + weights. After the build is done, then you use the lookup method to find suggestions. 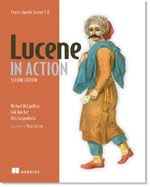 You mentioned suggestion lookup in lucene index. I would have thought that the AnalyzingInfixSuggester keeps an internal data structure in RAM built out of the lucene index and used for fast lookup? I guess a direct lookup in a lucene index would be much slower. I'm working on a custom suggester derived from this AnalyzingInfix. I need to add what you called a "blended score" (//TODO ln.399) to transform the weight depending on the position of the term(s) in the text. - adding a SpanQuery when searching to get a score that I can multiply with the weight. I would be happy to add these changes in Lucene, so do you think it's worth creating a feature ticket in Jira ? I think you should create a Jira issue so we can add this enhancement to Lucene? This would make a nice improvement. One challenge is the "early termination" that the suggester does now, since the index is pre-sorted by "impact" on the assumption that we'll only sort by the a-priori weight. We'd need to somehow relax that if we are in fact sorting by a different factor, unless that factor could also be pre-compiled into the index. Is there anyway to prioritize prefix matches over infix matches (irrespective of the weight)? Try BlendedInfixSuggester? It lets you score higher when the hit is in terms closer to the start of the suggestion ... not exactly what you're asking for but maybe it works? Thanks for your reply. Any idea why the spellcheck.count setting does not work with BlendedInfixSuggester? Seems to give 100 results always. Sorry, I just realized that it returns 10x the number of requested results by default. I guess it re-orders the results based on how far the matched word is from the start. Do you have any idea if it's possible to do filtering with this suggester module? I need to filter the suggestions by their id's. Something like "show me only the suggestiongs for cities with the state id = 14". Filtering is not easy with Lucene's current suggesters, but it would be simple to add to AnalyzingInfixSuggester since it's "just" a Lucene search under-the-hood. Maybe ask on the user's list (java-user@lucene.apache.org)? Thanks for the article. I have implemented Infix lookup with AnalyzingInfixLookupFactory but I am getting duplicate results in suggester. Do you know to avoid duplicate results here? Would really appreciate some code examples in stead of just end user examples! I currently index log files where each line is a Document with fields ( Time,Contents,Filename) using whitespace Analyzer + lowercasefilter . I use a single instance of Document for indexing by changing the field values. Where exactly should i have the Suggesters build method called is it during indexing or during search?